Middlesex have failed in their appeal against a two-point deduction in the County Championship, confirming their relegation from Division One. 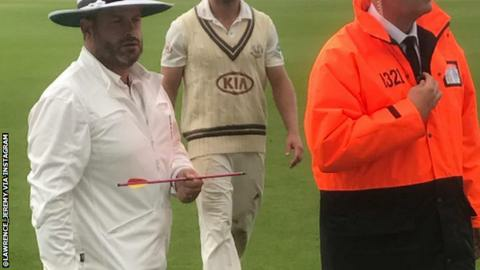 The punishment came for their slow over rate during August's match at Surrey, which was abandoned when a crossbow bolt was fired into The Oval. Middlesex finished one point below Somerset, who were ready to take legal action if the appeal was successful. Middlesex, county champions in 2016, will play in Division Two next season. The Cricket Discipline Commission (CDC) ruled that the matter did not need referring to a disciplinary panel hearing as "rules relating to over rates are clear and understood by all teams, coaches, players, and captains." Confirming that the county would not be taking the matter any further, chief executive Richard Goatley told Middlesex's website: "Whilst we still believe the imposition of the penalty was unjust, we accept the decision of the Chairman of the CDC and will move on. "We do not believe that any further action is in the interests of Middlesex or the wider game. We will now focus on regaining a place in the 1st Division at the earliest opportunity." Somerset counterpart Lee Cooper said in a statement that his club were always "confident that the ECB's original decision would stand" and were delighted with the outcome. "We are pleased that this has now been put to rest and we can concentrate on preparing for next season," he added. Middlesex were deducted two points after the crossbow incident at The Oval denied them the chance to improve their over rate in the remainder of the final session of that match. After the punishment was announced on 9 September, Middlesex CEO Goatley said there was "no scope" for an appeal, despite the fact he was "extremely disappointed" by the decision. Middlesex went on to lose their final game of the season at Somerset, who leapfrogged the 2016 champions with victory at Taunton to seal their own survival. A day after their relegation, managing director of cricket Angus Fraser told BBC Radio London they would raise the circumstances of the deduction with the ECB. And Middlesex confirmed they had "made submissions to the chairman of the CDC over the issue" last week. Cricket Discipline Commission chairman Tim O'Gorman said: "Middlesex have sought to argue that it was only because of the abandonment of the game that they did not make up their overs, but that cannot be entirely correct. "There was no guarantee that, if the game had run its normal course, those overs could ever have been made up. "I do not accept that Middlesex only agreed to the abandonment of the match on condition that their slow over rate in the first innings would be overlooked. "It is not within the power or gift of either the umpires or the players to make deals like that. "The match was abandoned for safety reasons. Play ended accordingly and the points earned or deducted should stand with effect from that time."